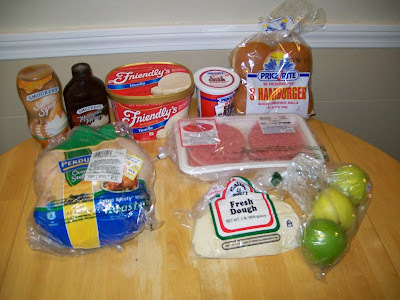 Frugal & Fabulous: More sundae supplies etc! What do you pay for hamburger/ground beef? Let me know! I would say anything under 2.00 is good - I got some 80/20 ground beef for $1.79 today, and it was considered and "extreme" deal. Usually the higher the percentage, the higher the cost, but I've found when I buy meat for hamburgers, it's easier to cook burgers with a higher fat content. curious what about the dough you bought, what kind is it? I don't think I have seen dough packaged like that. Also wondering if you have a good homemade ice cream recipe for peanut butter. I like the Willow Brook ground turkey in 1 lb packs that go on B1G2 at Big Y sometimes. Did you get the Friendly's ice cream for $1 at Stop and Shop this week? I was excited! 1.99 per pound for ground beef seems to be the norm now. With Memorial day coming up, I'm hoping to see 1.79 or 1.69 a pound so I can stock up.